The Nokia Lumia 530 has been in rumors since quite some time now and today for the first time, we have an alleged picture of the device. 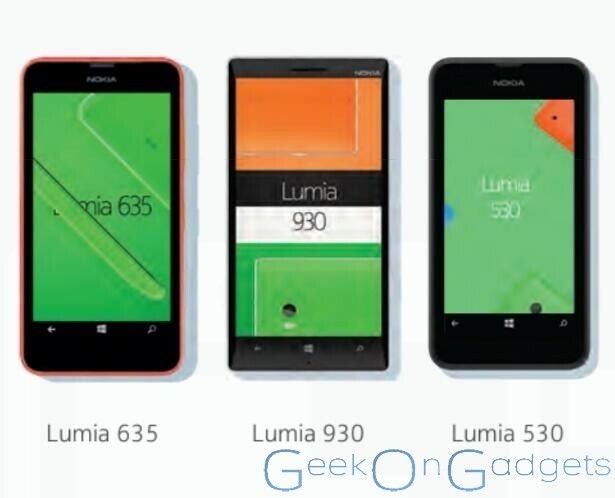 The picture shows us the alleged Lumia 530 alongside the Lumia 930 and 630. The devices does resemble the Lumia 630 with those rounded corners and big bezels. The device seems to be of the same size as the Lumia 630 but there’s a smaller 4.3-inch display in tow. The device features the on-screen navigation buttons just like the 630 and there’s no front facing camera as well. The Nokia logo is still present though. If the alleged picture is indeed the real deal then we must say, we are a tad disappointed. Nokia seems to have moved away from the elegant rectangular design of the Lumia 520 and 525, which we loved so much. Those huge bezels surely don’t do any good. The Lumia 530 was first rumored under the codename “Rock” and we recently came to know that the Lumia 530 for T-Mobile has the codename “Rise”. The Lumia 530 should still be a hit just like its predecessor, if Nokia does put a gig of RAM in the device and prices it aggressively. You tell us, what you think about the Lumia 530?